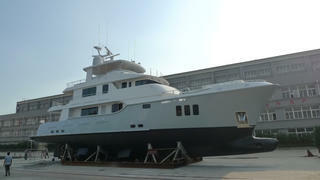 The second hull in the Nordhavn 96 series of explorer yachts has been launched and named Lacey Kay. This 29.56 metre tri-deck displacement yacht was built from GRP to AB classification at Nordhavn’s Xiamen facility in China. She will now be shipped across the Pacific to the yard’s American headquarters in Dana Point for final commissioning and handover. Lacey Kay can accommodate up to ten guests in five staterooms, including an upper-deck owner’s cabin, while her crew quarters allow for a staff of up to five people. The interior décor was created by Scott Cole, with walnut wood panelling as well as extensive use of granite, marble and ceramic tiling. The flybridge on Lacey Kay features a superyacht spa pool and cocktail bar, while the foredeck is dedicated to tender storage, with enough room to house a Caribe RIB and a centre console tender. Her beam of 7.32 metres allows for a total interior volume of 199GT, while her twin 454hp Caterpillar C18 ACERT engines can deliver a top speed of 12 knots. Built for long-range cruising, her 26,498-litre fuel capacity translates into a maximum range of 3,000 nautical miles at 9 knots. Lacey Kay follows on from the first Nordhavn 96 Macguffin, which was delivered earlier this year. The design is based on the popular 26.2 metre Nordhavn 86 series, but with a 3.3 metre cockpit extension. 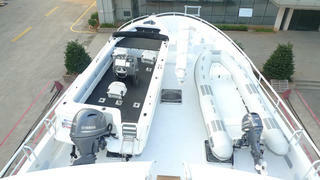 Other projects currently under development at Nordhavn include the third and fourth models in the N96 series, both of which are already under construction in Xiamen.